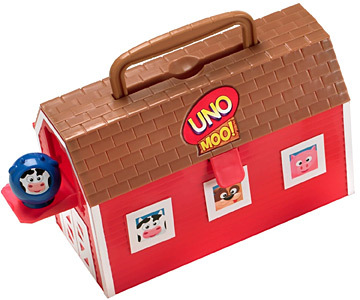 In a colorful red barn are colorful farm animals that help kids learn about matching. From Uno, the matching card game, the wild card is the farmer, who matches with any animal or color. The first player to get all of their figures back in the barn wins the game. The barn is a carry case that serves for storage. A total of 28 figures come in the set. Great for imaginary play which is also educational as it teaches similarities and differences between colors and objects in the form of animals.